Obituary for Ben Norman Bowman | Delancey-Murphy Funeral Homes, Inc.
Ben Norman Bowman of Marked Tree was born January 24th, 1933 and departed this life to be with God on April 6th, 2019 at St. Bernard’s Hospital surrounded by his loving family. 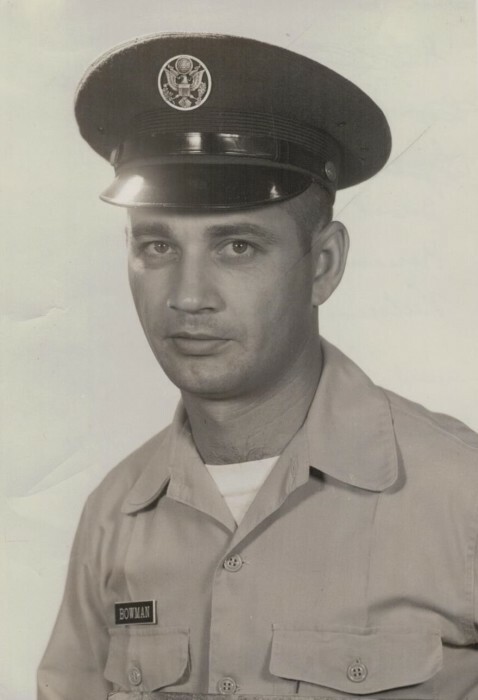 Ben proudly served his country in both the Navy and Air Force during the Korean and Vietnam War era. He served the navy from 1950 – 1958, first serving on the USS Ajax AR-6 and then on the Gardener’s Bay. He then went on to join and eventually retire from the Air Force, serving from 1958 – 1971 where he achieved the rank of Senior Master Sergeant. He was first stationed at Vandenburg Air Force Base in California and then at Cape Kennedy in Florida where he worked on the Titan III Missile Program. He proudly received the Air Force Commendation Medal and was also recognized for his exemplary work on the Missile site. After retiring from the Air Force, Ben moved to Jonesboro and went to college, obtaining a Master’s Degree in Math and began his third career, in teaching. He taught first at Harrisburg Central High School and then taught for 21 years at Marked Tree High School where he also served one year as interim Superintendent. Continuing on with his work ethic, after retiring from teaching, he worked at Gillis Construction as their Bookkeeper. He loved the Lord and was a former deacon and Sunday School teacher at Lepanto First Baptist Church, and after moving to Marked Tree became a member of 1st Baptist Marked Tree. He married the love of his life Hazel Harmon on February 27, 1954 and was married for 65 wonderful years. He was preceded in death by his parents Vonlie and Maggie Bowman, three brothers, Bazil, Harvey and James Bowman and one sister Betty Morgan. He is survived by his loving wife Hazel, two brothers, Winston and Oliver Bowman and four sisters, Magalean Harrison, Edna Cunningham, Adelle Bridges, Cathy Dees, four children, Gregory (Trish) Bowman of Cordova TN, Cindy (Chris) Rizos of Redding, CA, Toya (Glenn) Gillis of Marked Tree and Alan (Tammy) Bowman of Jonesboro, eleven grandchildren and eight great grandchildren and many nieces, nephews, friends and students. Pall Bearers will be Christopher Bowman, Garrett Gillis, Jared Gillis, Brandon Gillis, Butch Tucker, Barry Bowman. Honorary Pallbearers are Brian Bowman, Alexander Rizos, Odysseas Rizos, Brevan Bowman, Heather Willett, Christina Rizos and Breah Bowman. Visitation will be held Monday, April 8, 2019 from 6:00p.m. to 8:00p.m. at Delancey-Murphy Funeral Home in Marked Tree and a celebration of this wonderful life on Tuesday, April 9, 2019 at 11:00a.m. at First Baptist Church, Marked Tree.